The digital issue of December's Game Informer is out now, and with it comes a boatload of new information on Grand Theft Auto V, including the fact that its world will be bigger than the worlds of Red Dead Redemption, San Andreas, and Grand Theft Auto IV combined (at least according to Rockstar). According to Rockstar, Grand Theft Auto V's Los Santos is bigger than Red Dead Redemption, San Andreas, and Grand Theft Auto IV combined. Yep. There's wilderness, a military base, and even an ocean floor to explore underwater. You can switch between the game's three main protagonists at "nearly any time." Those three protagonists, by the way, are named Michael, Trevor, and Franklin. Michael is a retired bank robber who gets sucked back into crime; Trevor is a career criminal and drug addict; Franklin is a 20-something street hustler. Sometimes they'll work together on missions, during which you can switch back and forth from character to character depending on which part of a given mission you feel like doing. Each character has his own personality, skill set, and group of friends to interact with. And the ones you're not controlling will go off and do their own thing. This is the same world as Grand Theft Auto IV and Liberty City, so you might see some recurring characters from those games (just not the major ones, like Niko Bellic). But. Rockstar says this is the "high-definition" world of Grand Theft Auto, so don't expect to see anyone from the PS2-era titles. Remember those randomized dynamic missions in Red Dead Redemption? They're back for GTAV: expect hitchhikers, muggers, and dead bodies, among others. Rockstar says there will be an economy, but you won't be able to buy properties. There will be "loads of other stuff." You can get the digital copy of this month's Game Informer online right now. The dead-tree edition should be out within the next week or so. 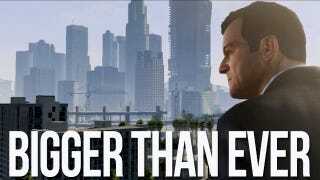 As for Grand Theft Auto V, we can expect the game spring 2013 for Xbox 360 and PS3.